Last Wednesday, Charlotte’s housemate, Mark, told me he was going to camp at Big Lagoon for a few days and through the weekend, so I asked if I could go along. He said sure, and he picked me up Thursday afternoon. He planned on fishing, and I wanted to make photos of the scenery there. We got to the campground at about 5 o’clock and still had plenty of time to set up tents. 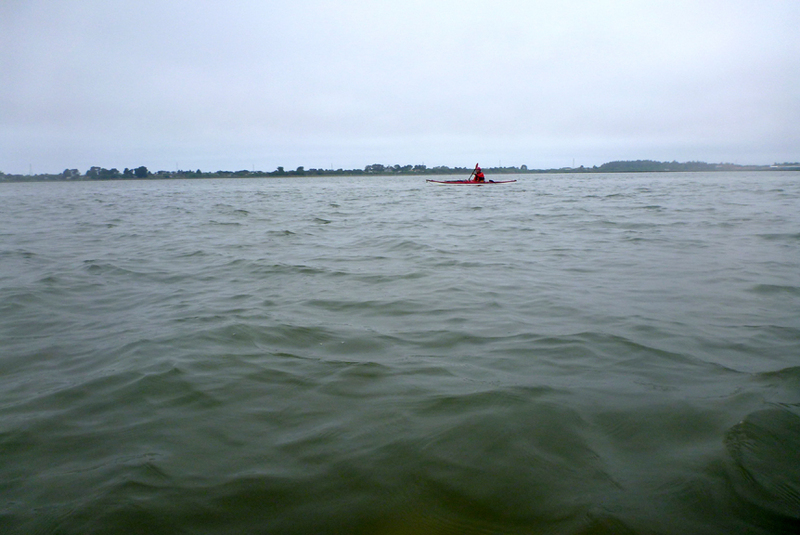 I immediately paddled out on the lagoon under a threatening sky and into a moderate wind. After a short trip and dinner, I slept well. 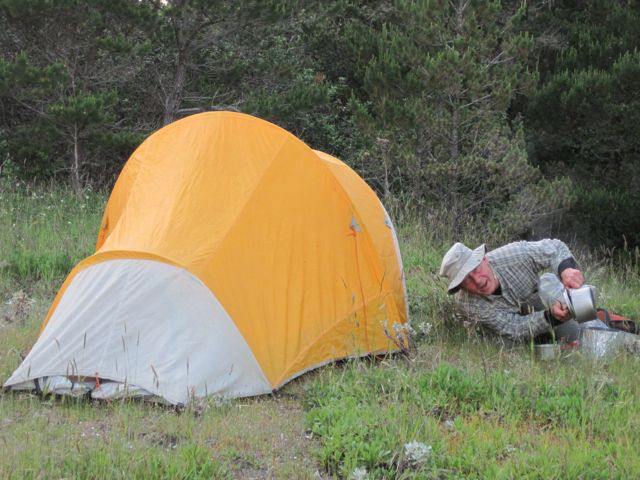 I was glad to have set up the tent, instead of sleeping “under the stars”, because it rained for a brief period that night. 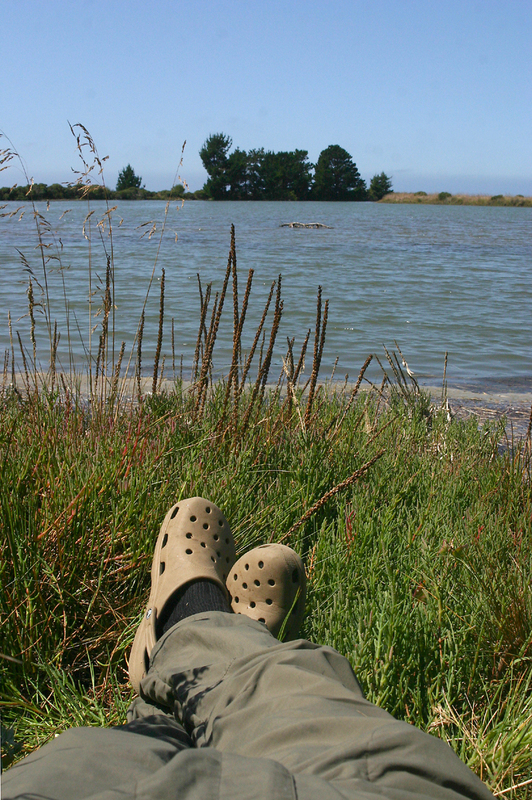 The next morning I headed straight for the north end of the lagoon where it breeches and stayed there with the camera until I took a lunch break. The water was clear and almost flat; there was little wind. Then I headed back towards the campground. I bumped into Mark as he drifted his bait along the bottom; he said he had gotten a couple of good strikes. We chatted for awhile and then I went over to the spit and took a nap. Later in the day I poked along the eastern shore of the lagoon and walked the beach, looking at the rock formations and patterns in the sand. I discovered a Humboldt Gum plant, an endangered specie which I had seen before only on Humboldt Bay. Other plants perched on the rocks, and many of them were blooming. By that time, the wind had kicked up sizeable wind waves out on the lagoon, and the sound of them on the beach was like music. 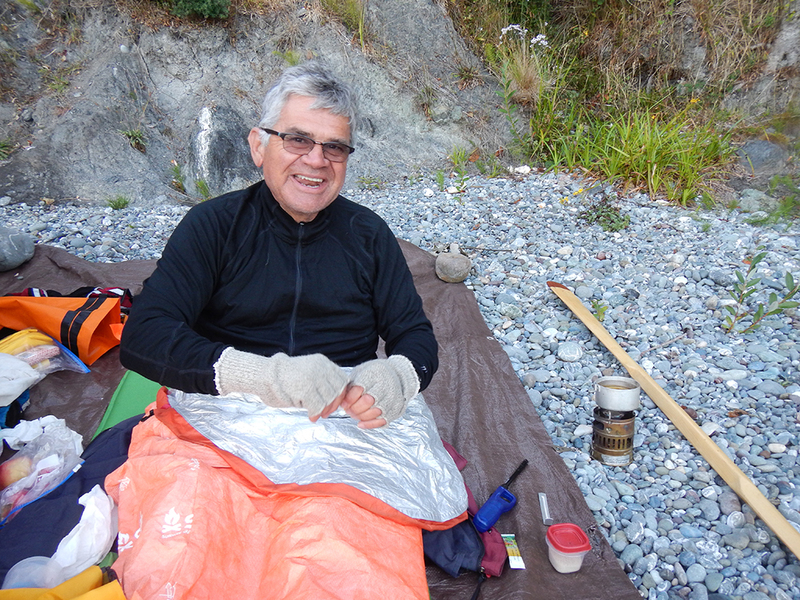 After a few more photos I paddled back to camp for dinner and a good night’s sleep. 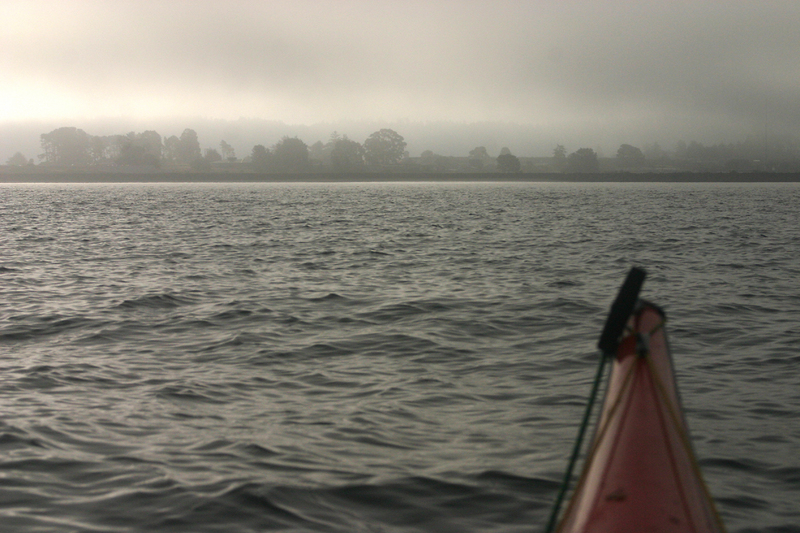 The next morning Charlotte picked me up and we went over the hill to Stone lagoon for the Explore North Coast hosted Rescue Practice Paddle. Thanks, Mark and Charlotte, for a great weekend on Big Lagoon! 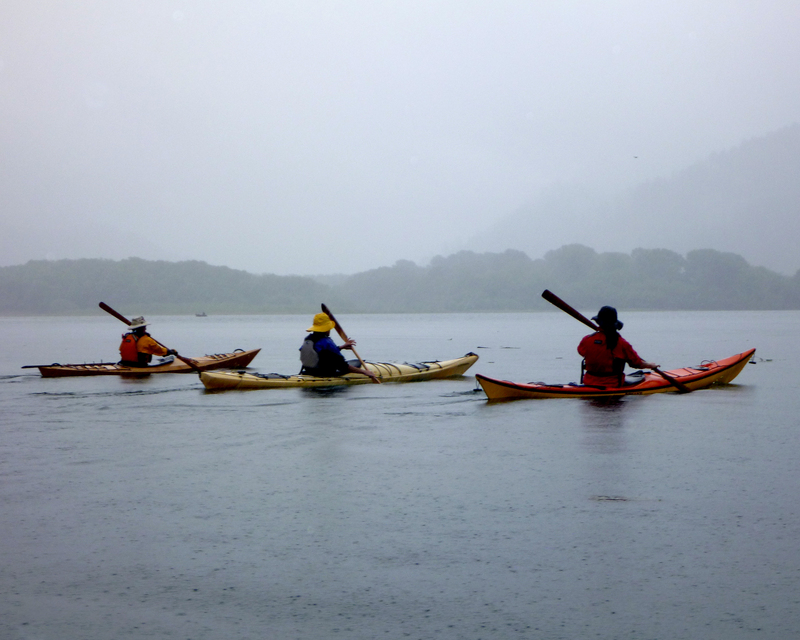 An unseasonal rainy spell affected the turnout for this mellow paddle but eight dedicated explorers showed up at the put-in at the mouth of the Klamath river. The water level was much lower than expected but the tide was on the rise. 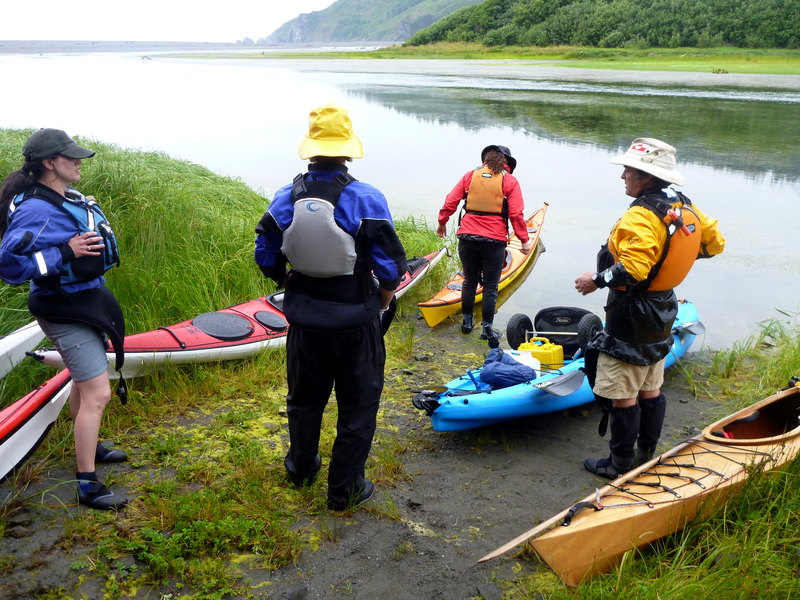 We began by making our way up the first channel, poking through weeds and shallows as far as we could. Quite a few Osprey were screaming and flying overhead. Also lots of birdsong could be heard in the riparian area. 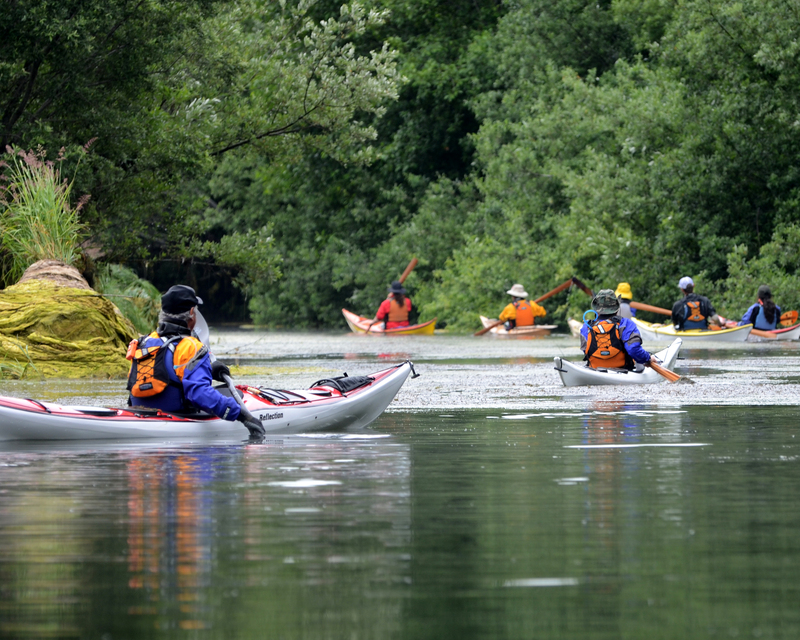 We retreated and headed up the next navigable arm. 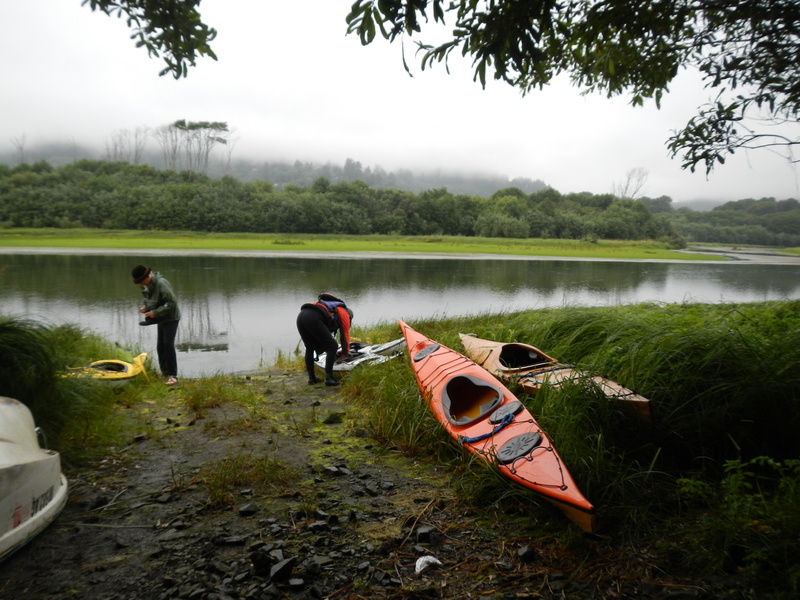 By the time we’d explored this area the tide was up and we headed along the sandspit. 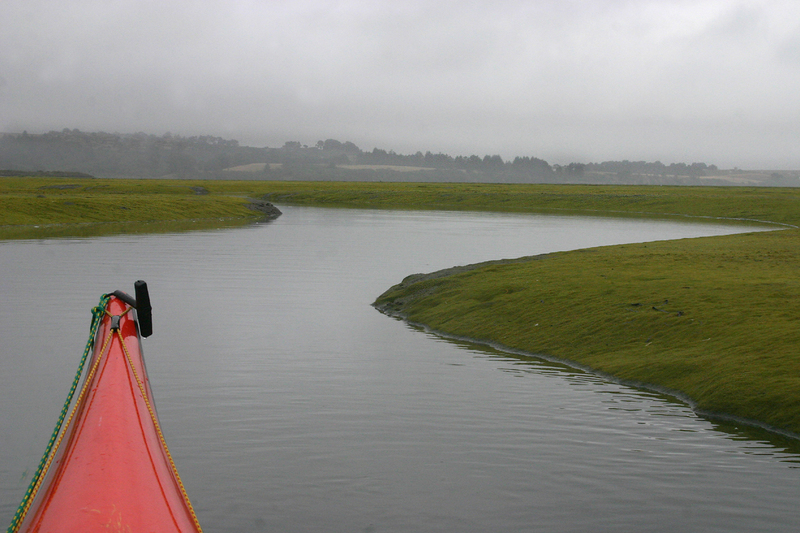 The mouth of the river had shifted from our last visit; the river now exiting in the middle of the spit. The river flow was quite low so there was no issue of being swept out to sea. Rather, the ocean was sending water into the estuary and filling it up. 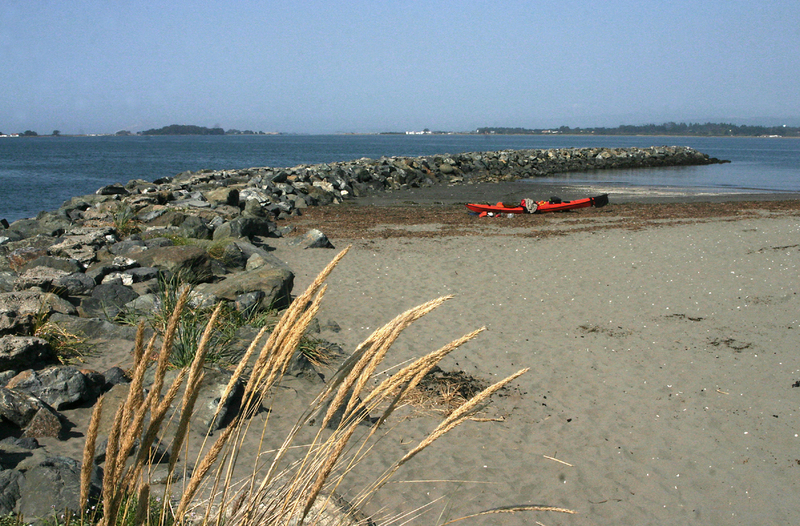 We paddled across to the north end of the beach where the old mouth had been and landed for a picnic on the ocean side. Probably an hour or so into lunch the rain began to come on in earnest so we packed up and headed back to the put-in to call it a day. 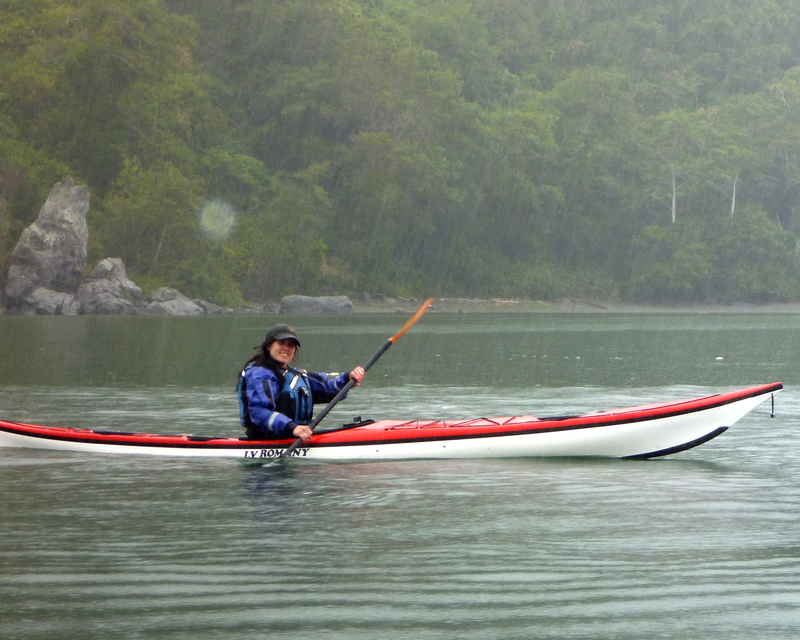 In spite of the weather another enjoyable adventure on a (for me) rarely visited stretch of water. Thank you to all who attended:Brent, Scott and Jen, Scott Harrison (who took the photos), Greg, Georgianna, and Bruce. 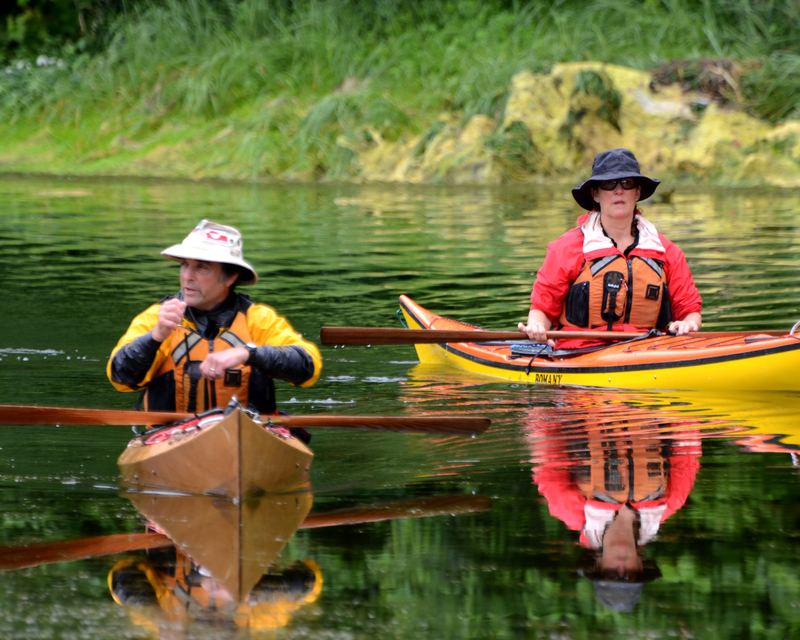 The theme for this paddle was apparently “Funny Hats.” Georgianna and Bruce won. 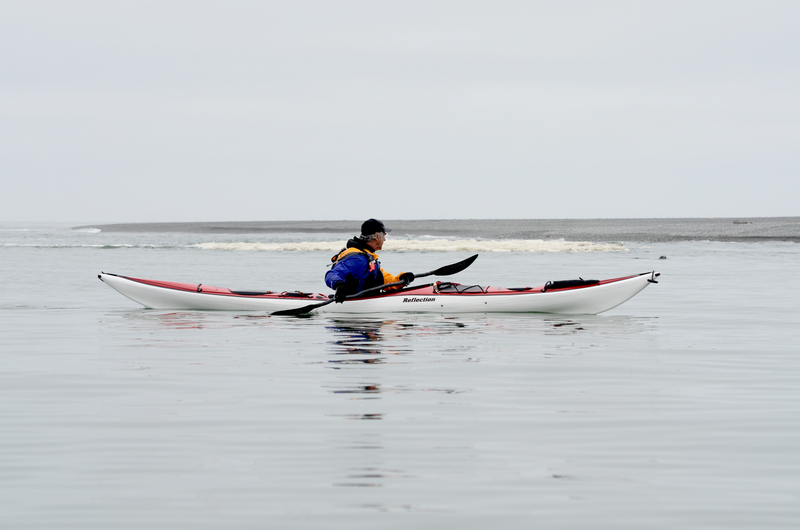 Mark sits with the boats before leaving for the paddle north. Nick stows gear at Indian beach. 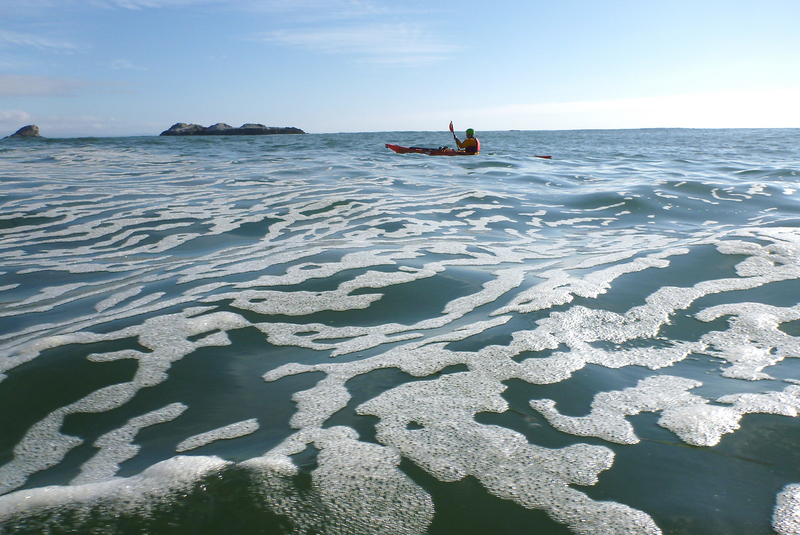 With a week’s notice, Nick let me know that he wanted to paddle to and camp at Whale’s Head north of Trinidad. 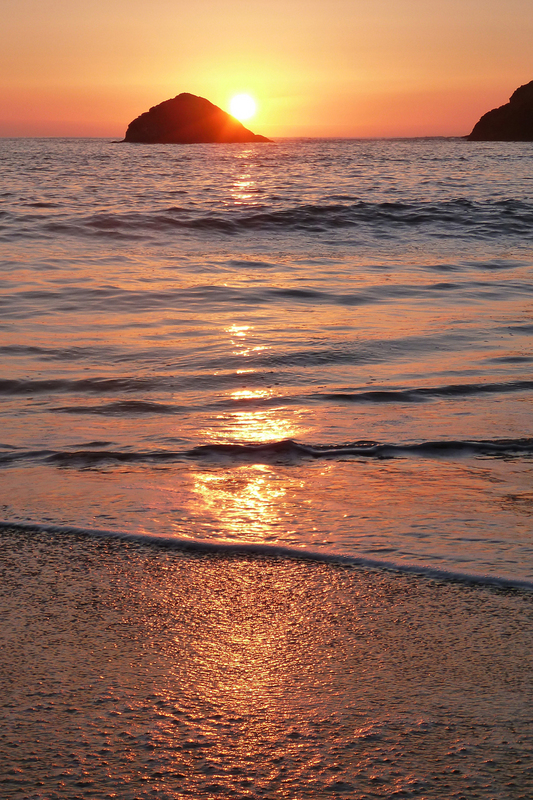 He wanted to paddle out in the late afternoon, and I wasn’t sure I wanted to be on the water that close to sunset. 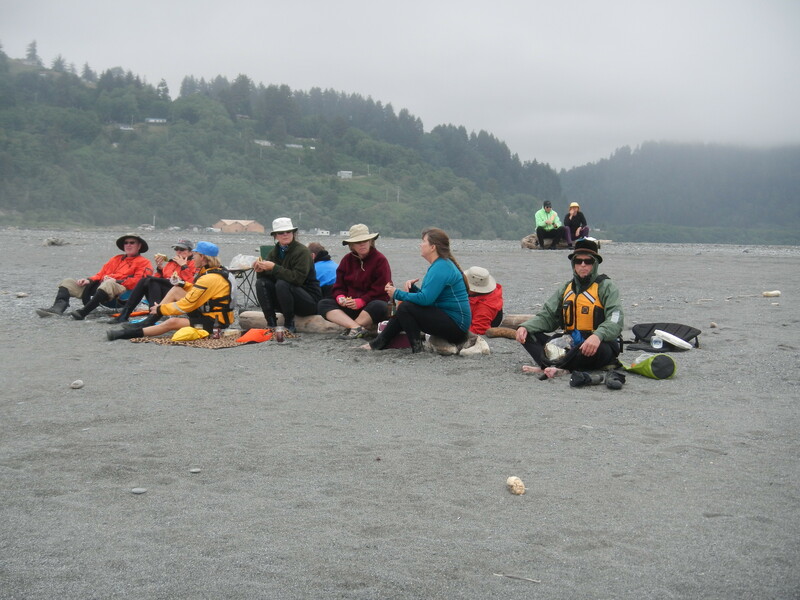 We finally packed up and launched at Indian Beach at about 4:30pm on Saturday. Nick and I paused for a photo-op off Elk Head. Nick and Mark off Megwil Point. straight for Megwil Point north of College Cove to see what the waters looked like toward Whales Head. 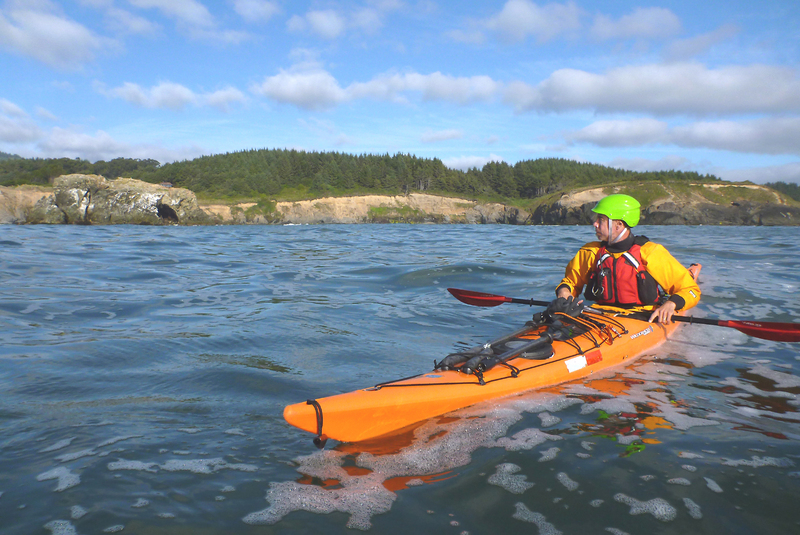 The evening light was unique (we usually paddle in the morning) and it was different to see the coast sunlit from that side. 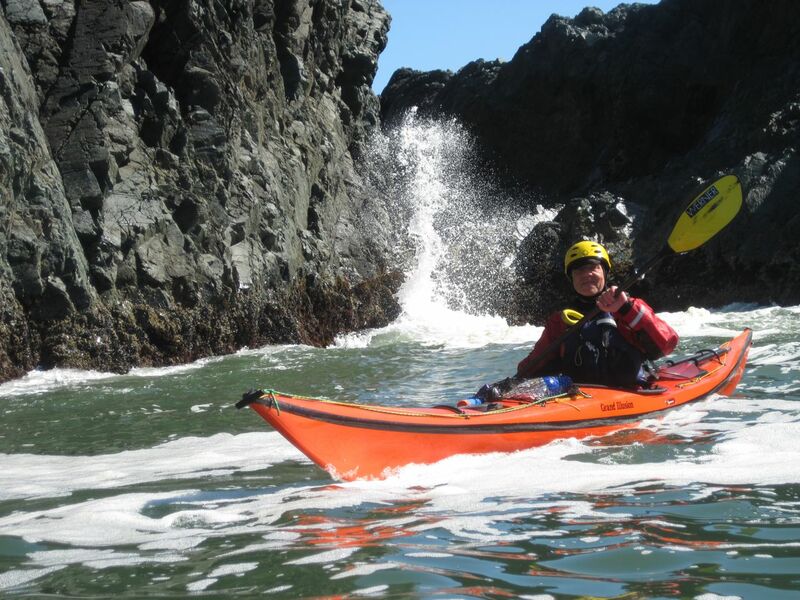 We got as far as Green Rock before deciding to turn back and spend the night at College Cove. 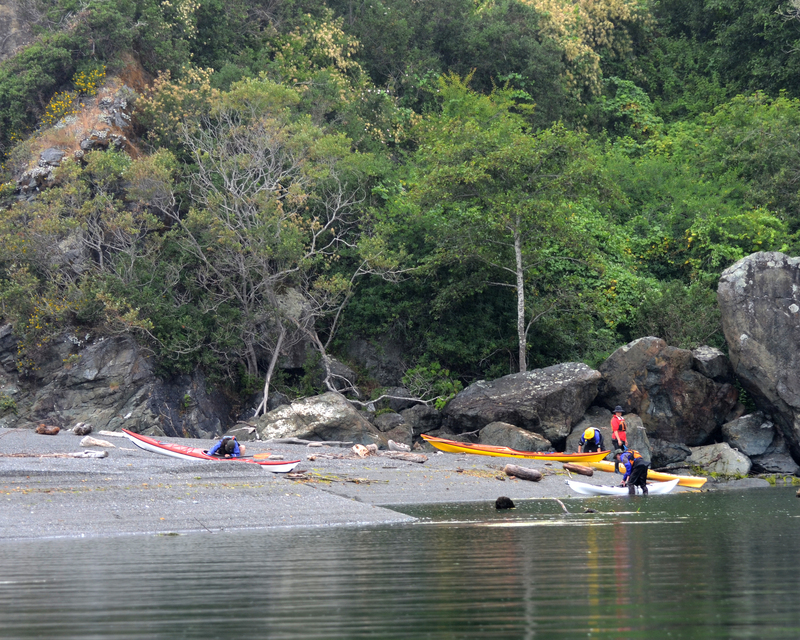 Landing at the east end of College Cove was easy, once we timed the conditions at the beach. 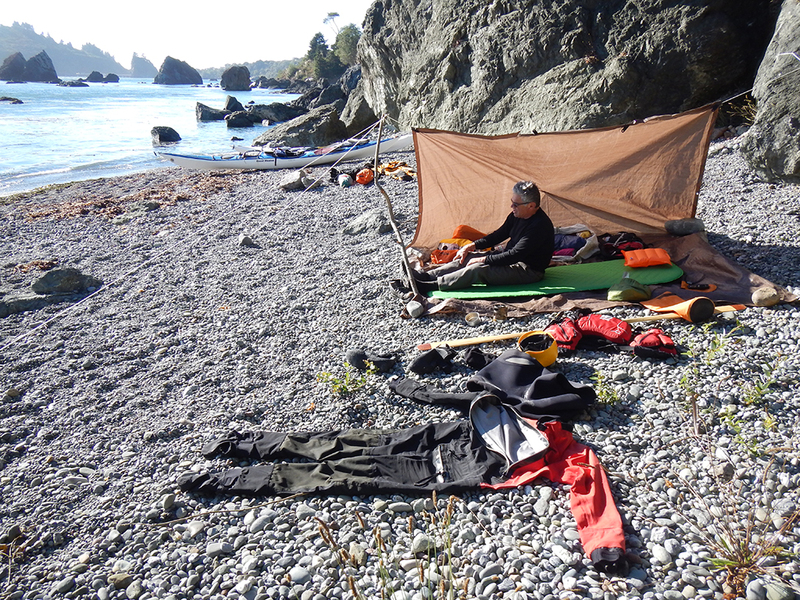 The beach was wider there, and we found a couple of suitable tent sites. 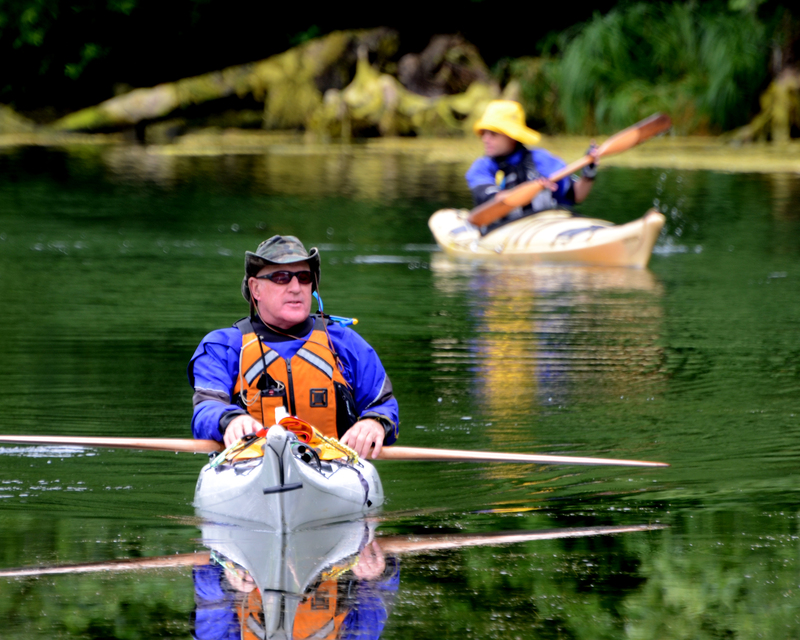 Nick (top) and Mark paddle through the foam toward the night’s camp. 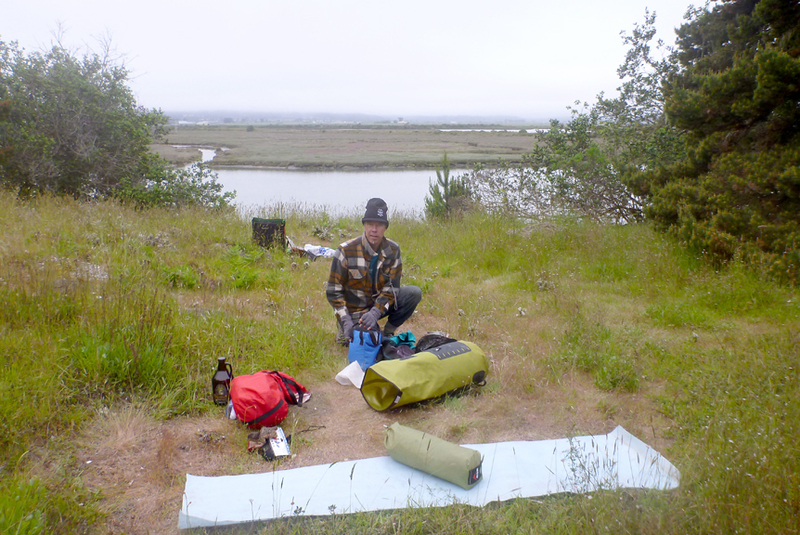 I set up my tent. a big bottle of beer. It was a pretty evening with a great sunset. We stayed up ’til 11 o’clock talking, enjoyed the clear, starry sky, and we hit the sack expecting fog and drizzle in the morning. It stayed clear all night, and Sunday morning was clear as well! 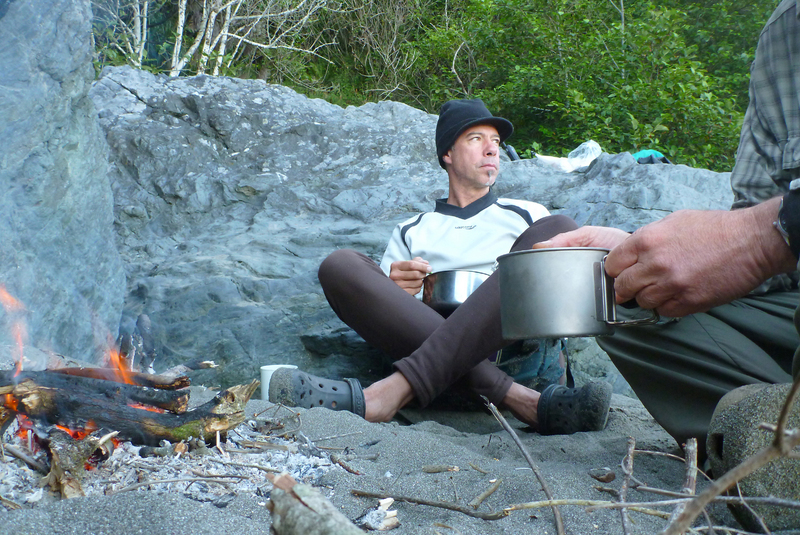 I gathered wood for a small fire and Nick and I were having breakfast at about 7 o’clock. 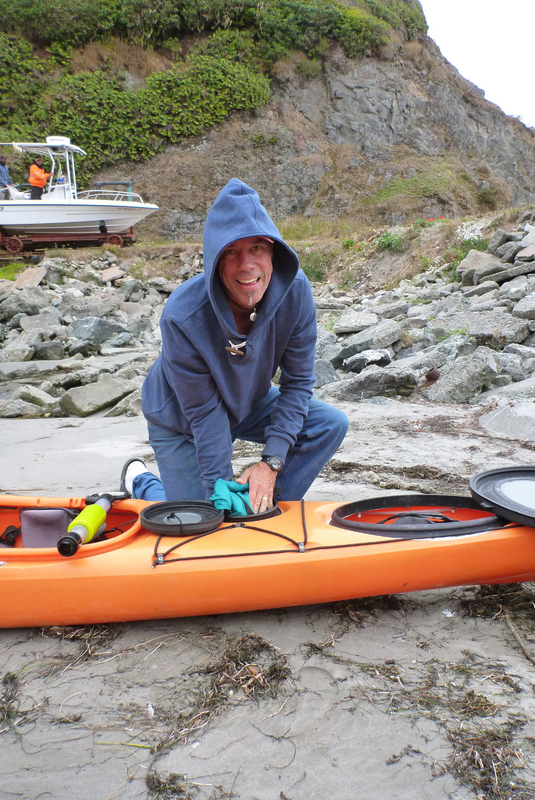 Then we stuffed the gear, packed the boats, turned on the radios, and Nick checked to see if any ENC paddlers were within hailing distance. 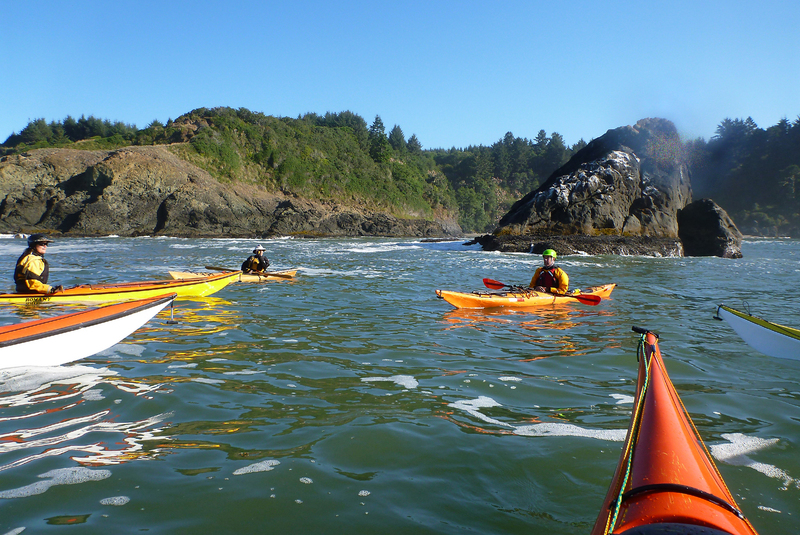 Michael responded and he and half a dozen others met us off the cove. the “Sunday Services” group meets us soon after launch. 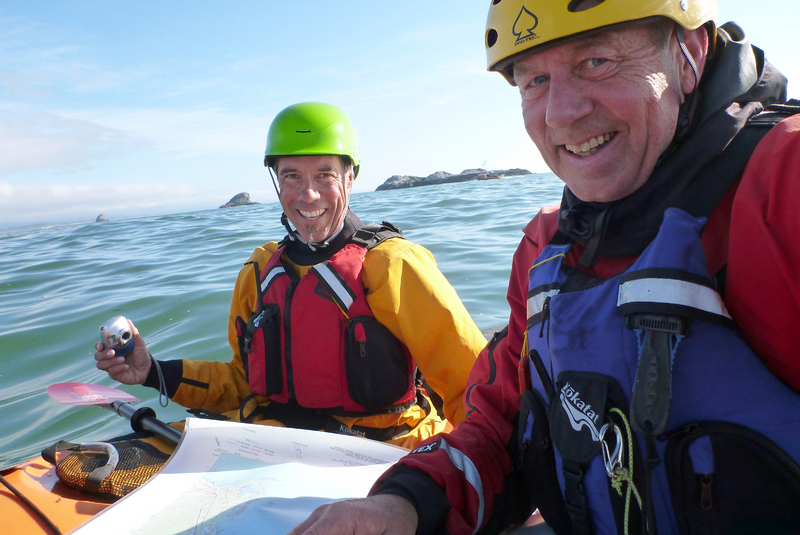 From there, Nick and I paddled back north past Megwil Point and Green Rock and toward Whale’s Head. The conditions were similar to the previous evening, with an early wind and chop. 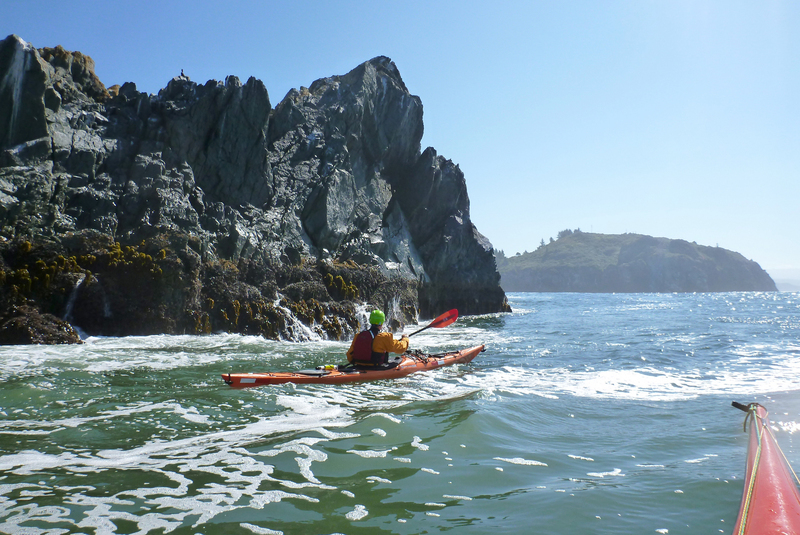 It was great to paddle a new and different area and exciting to keep alert for new rocks and reefs. Our chart didn’t name Whale’s Head so Nick pointed it out to me as we got there. 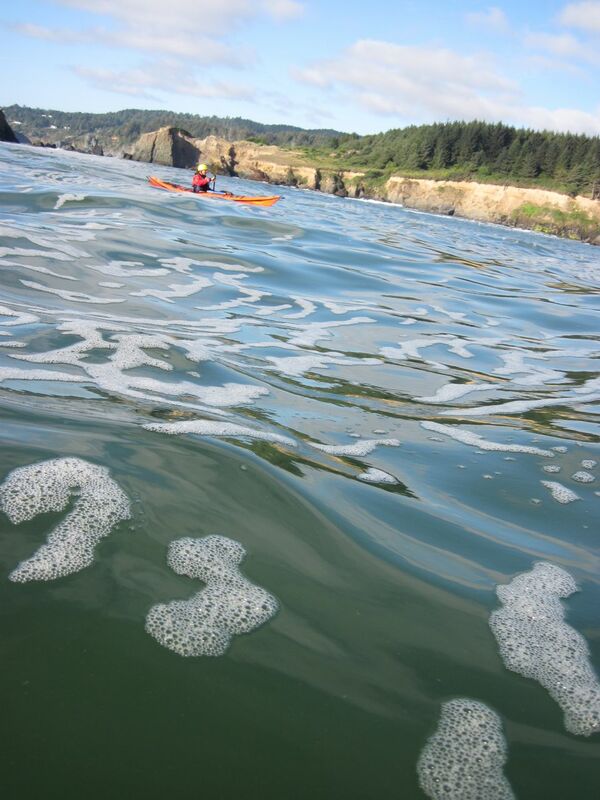 We paddled in slowly toward the “beach” and looked for possible landings, and, despite the swells, got well inside the cove formed by the Head. 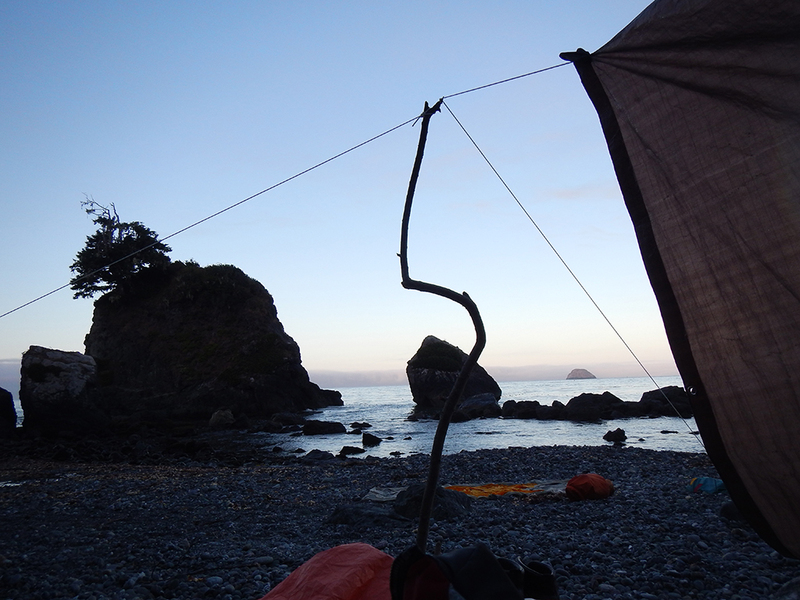 In the half hour we spent in the moderate protection of Whale’s Head, we didn’t see any possible tent sites, and only 2 so-so landing sites. I suppose that if we had been with a larger group, we might have landed then, but we were being cautious, so we didn’t. 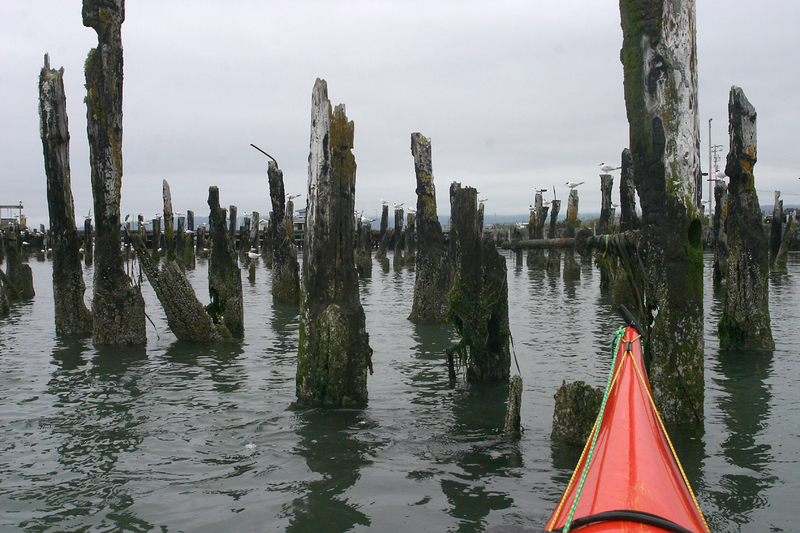 One tern per piling seems to be the rule at this burned out dock. Greg keeps up with the current on his way south. 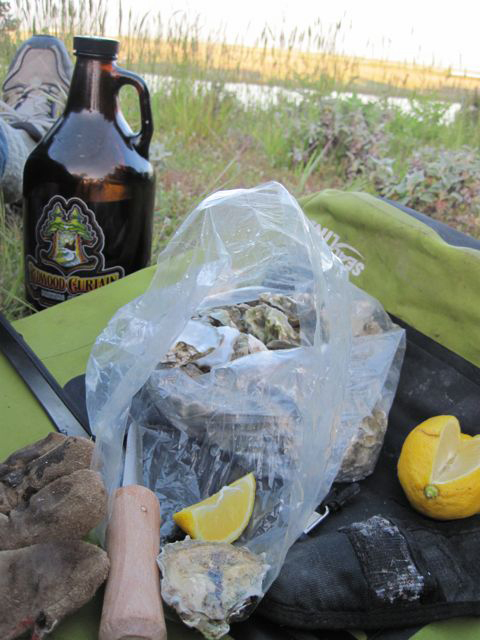 I paddled to a couple of new campsites this gorgeous Labor Day weekend. 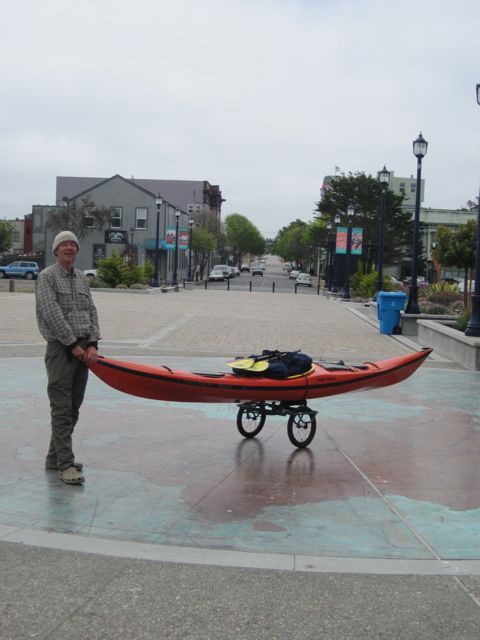 I launched from the C Street dock on the Eureka waterfront late Saturday morning and fought the tide south on the way to King Salmon. I topped only to take a few photos on the way. 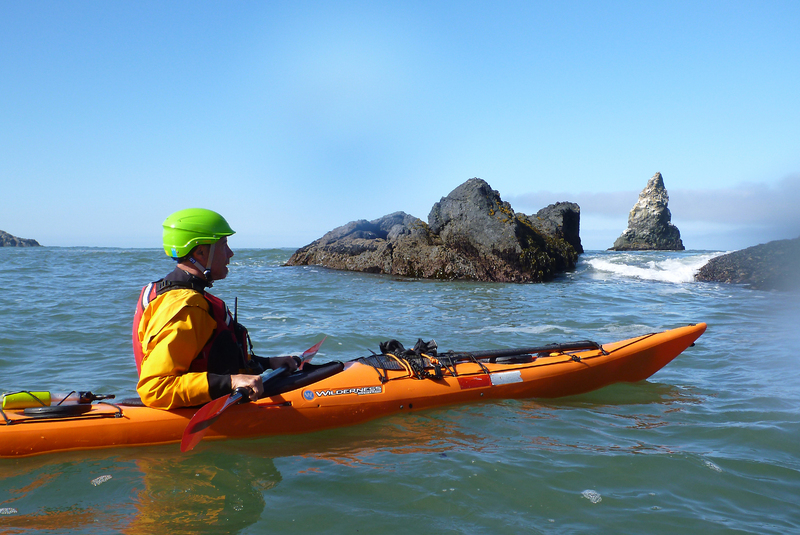 I came upon Greg from Pacific Outfitters going the same way near Fairhaven. 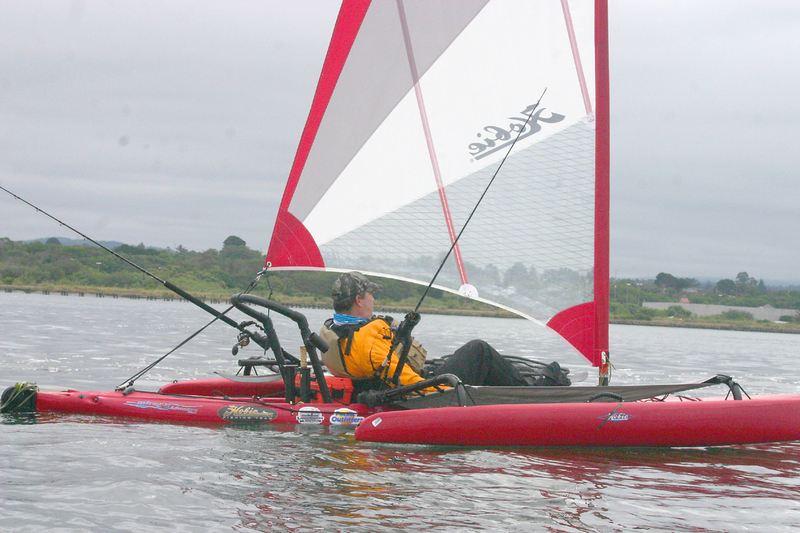 He was just holding his own against the current with the pedals and sail on his Hobie. He passed me once the wind picked up and while I was making photos. 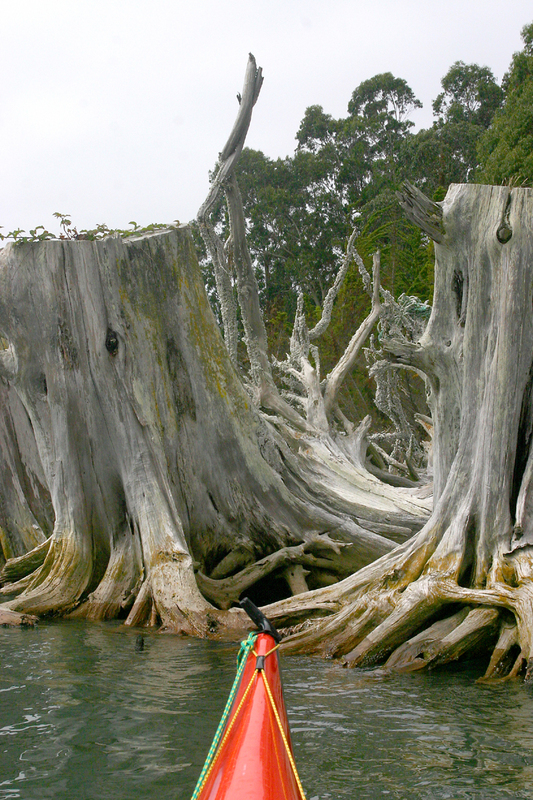 The weathered remains of the trees on the beach made an interesting sight. 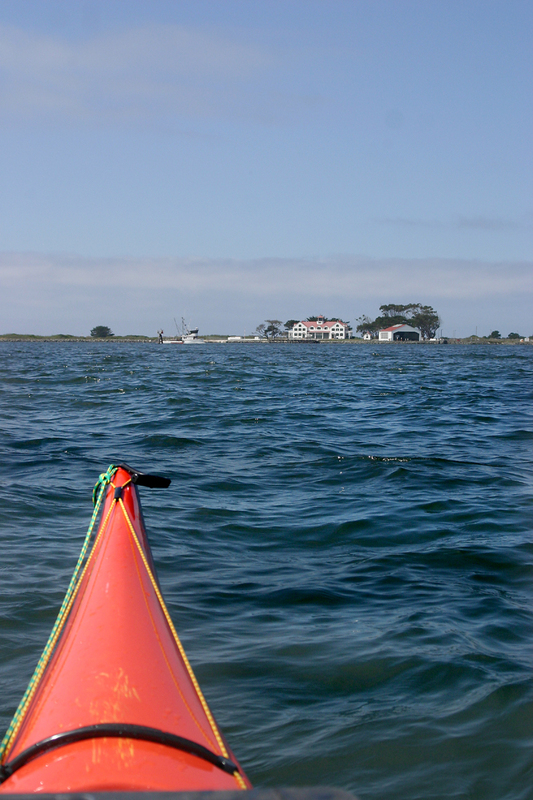 The old Humboldt Bay Yacht Club sparkles in the sun. I headed straight for King Salmon from there and crossed the wide part of the bay in front of the Bar. I chose the end of the beach furthest from the houses. It took about an hour to cross to the beach at King Salmon, where I found as many dogs as people. 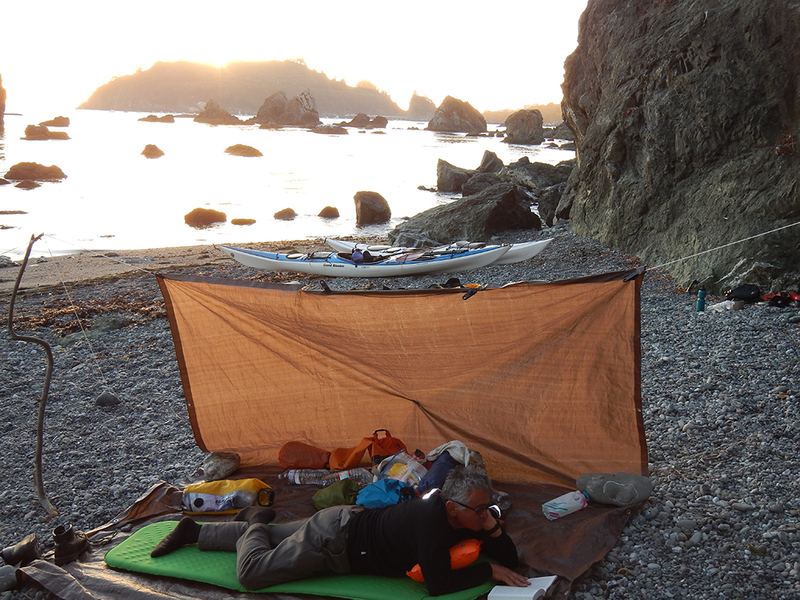 I checked out possible camp sites and decided on the beach inside the breakwaters. I had coffee and waited for evening. 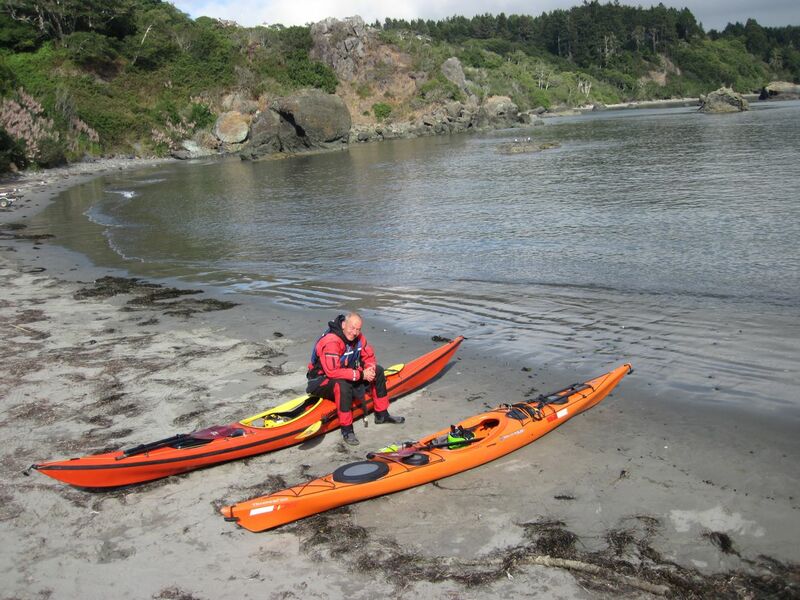 The dogs on the beach got interested when I was cooking dinner and a few people asked about the kayak. I had a good view of the Bar from my beach and the sport and commercial boats coming and going. 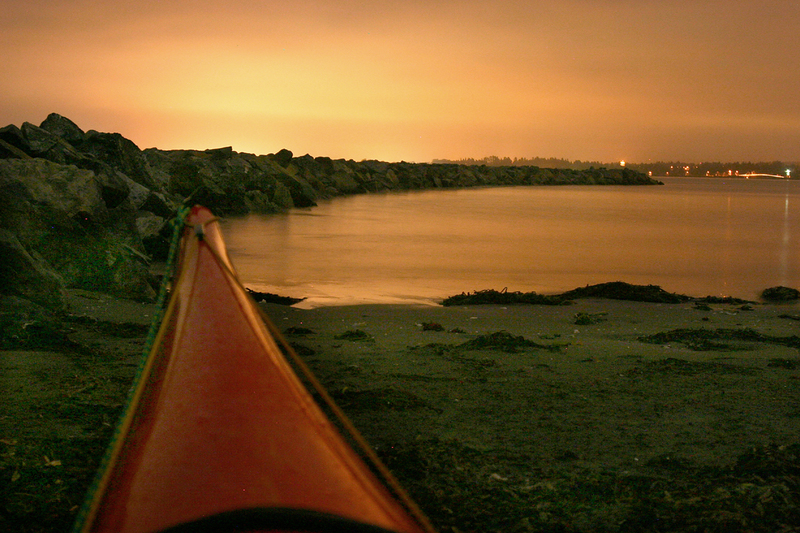 A long exposure and resting the camera on the boat captures the glow of the city and lights up the beach. The last few beachgoers left a little after sunset and no one bothered me that night; I slept well, waking up just to see the big moon and the lights of Eureka. 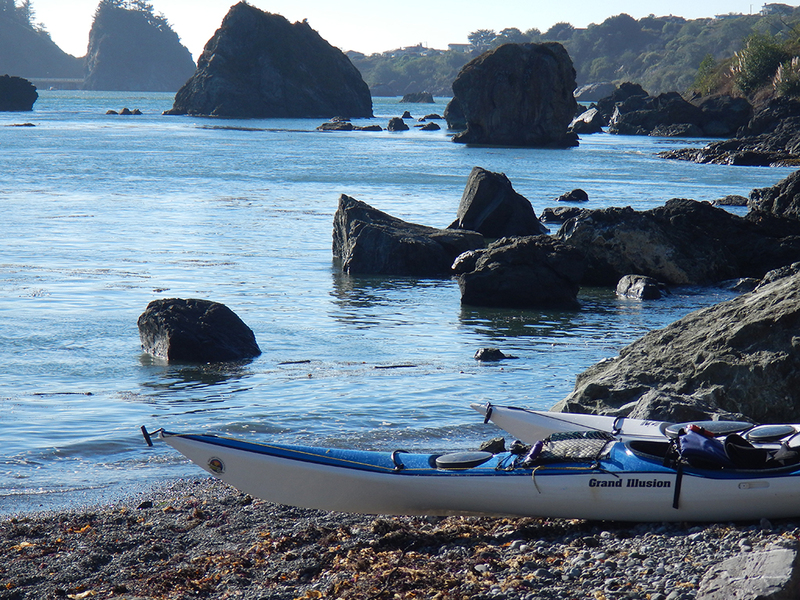 I waited for the tide to rise so I could keep paddling! 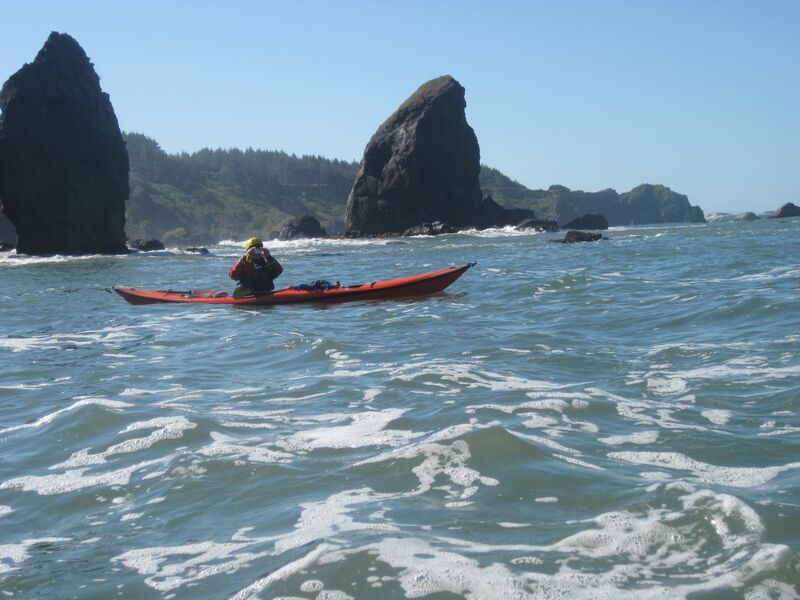 I took my time about getting on the water the next morning because the tide was low and would be going my way for hours. 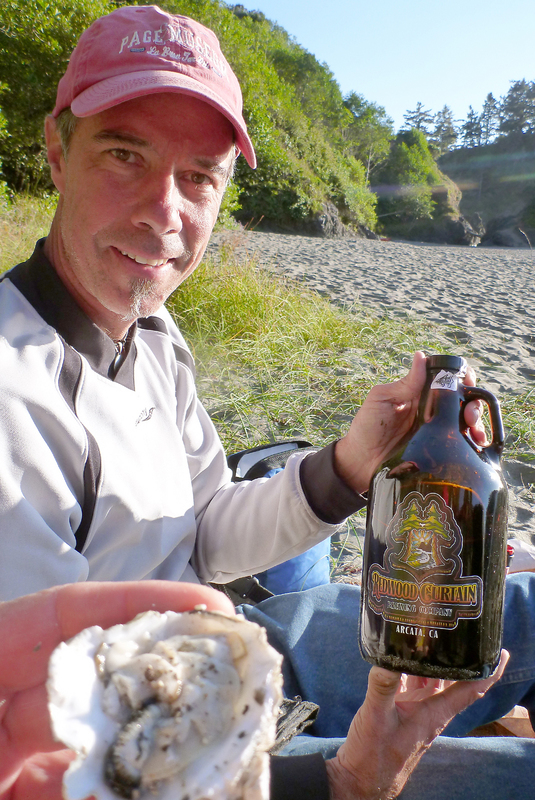 In an hour I was deep in the mudflats of southbay and waiting for the tide to rise so I could keep going! 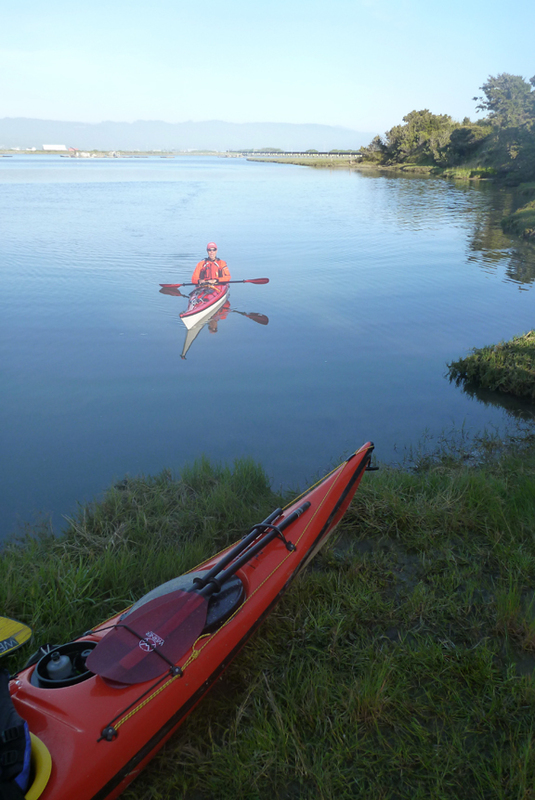 It took an other hour, but finally I was able to paddle into the main channel of White Slough and my next night’s camp. Again, I checked the whole area at the end of the slough for the best site and decided on the flat top of a dike overlooking the place that the Jupiter used to rest in the mud. I look over the site of the old dredge- Jupiter- that made the dikes all over the bay and finally rested in the mud ’til it burned to the waterline. I had the whole day ahead of me, so I took photos, relaxed, talked to myself, took more photos, made coffee, ate lunch, etc. 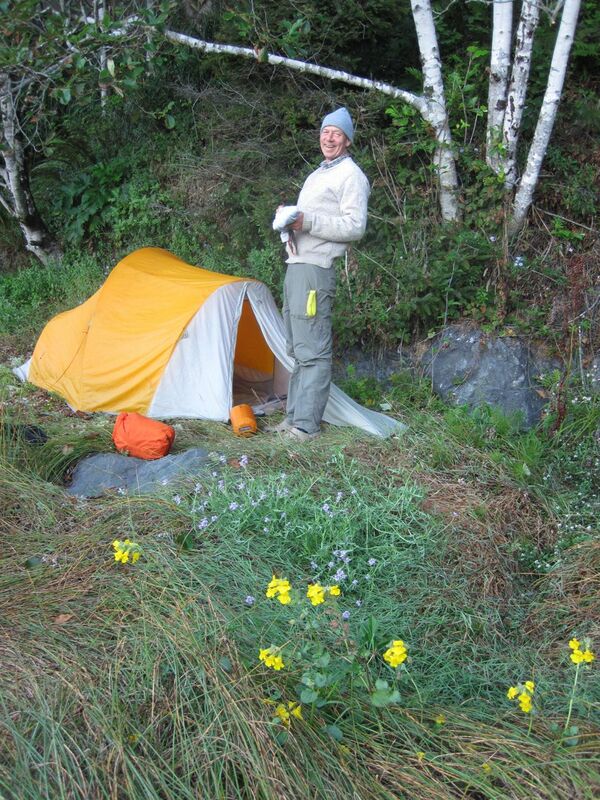 It was good that I didn’t camp in the woods below the dike, because it was currently home to a bear. That made me a little wakeful that night, but the only disturbance I had was from a possum coming down the dike. Crossing the Bay again was foggy this time. To make the tide this time I got up at 5 o’clock. After coffee,and granola/yogurt, I headed back at 6:30 and was at King Salmon at low tide- just in time to get the current back to the Eureka waterfront. I reached the C Street dock at 10 o’clock and had the whole rest of the day to dry and put the gear away. 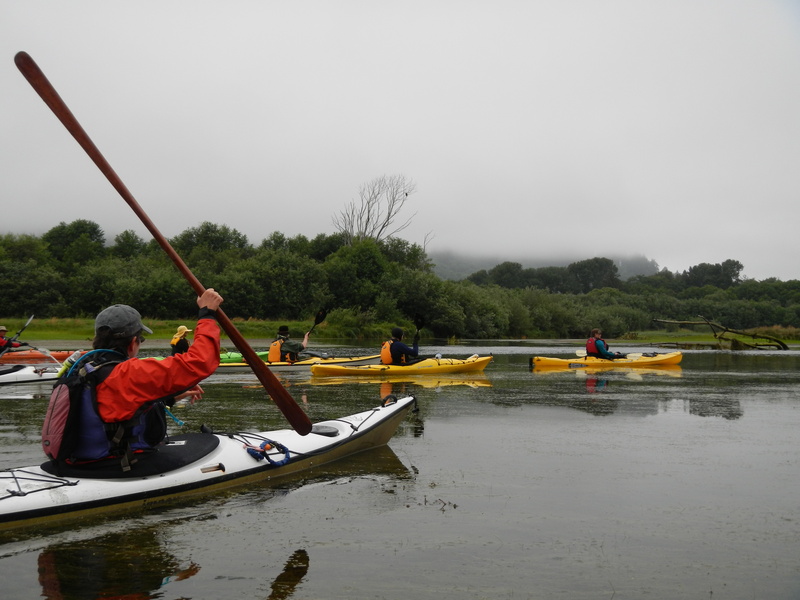 Twelve inquisitive paddlers gathered at the Klamath estuary sunday morning and be 10:15 we were on the water and ready to explore. An adult bald eagle was perched in a snag across the way warily observing the operation. 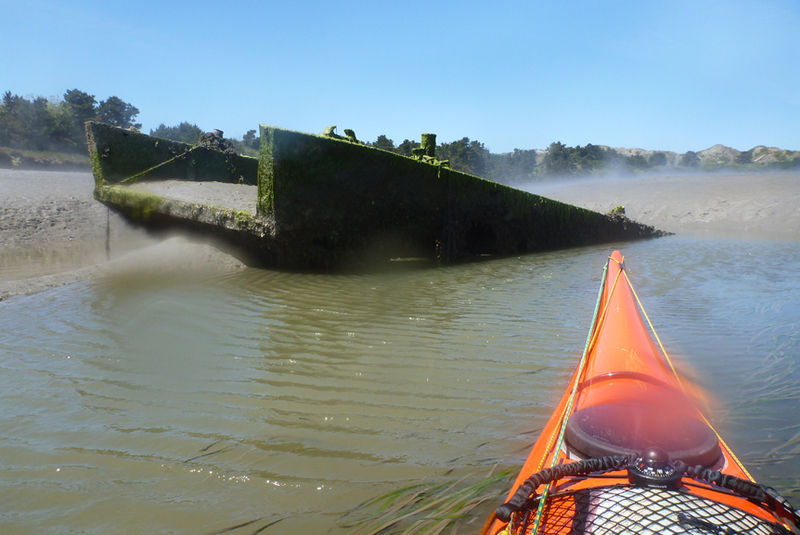 All boats launched, we make our way up the first channel nearest the frontage road. Kingfishers, cormorants, mallards, and osprey abound and we are surprised by a sighting of a beaver swimming non-chalantly across the channel. We follow successive sloughs up to dead-ends. The water level is low due to a minus tide but beginning to rise. After the beaver sighting we become aware of many large tunnels into the island banks. We’re on our way. The blob in the snag is an adult bald eagle. The eagle is unperturbed as we paddle by directly underneath its perch. 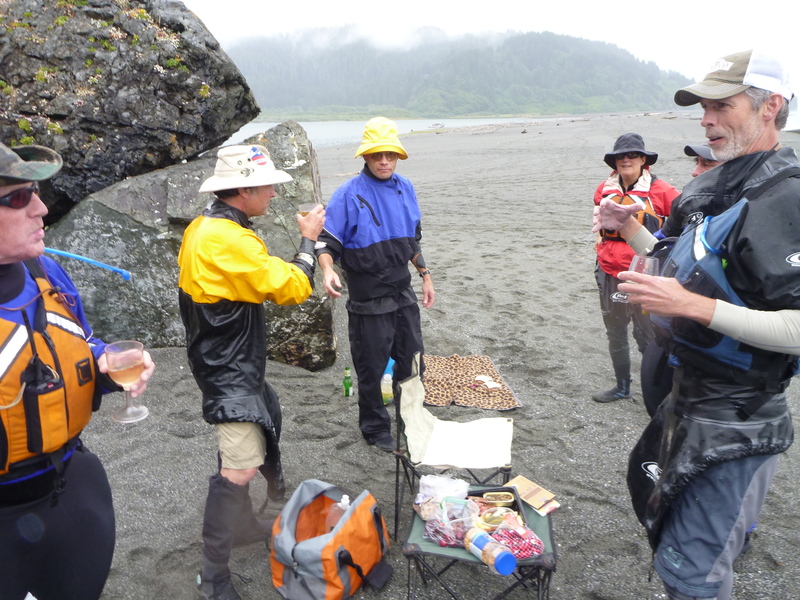 The estuary is beginning to fill up by noon so we head to the spit to take a break and have some refreshment. A line of blue sits out over the ocean and we will it our way but the day remains overcast. As scheduled, during lunch break a grey whale meandered by in front of us. A huge flock of elegant terns were roosting on the spit and occassionally would rise up in a raucous mass. After lunch we were all pretty relaxed and lazy. 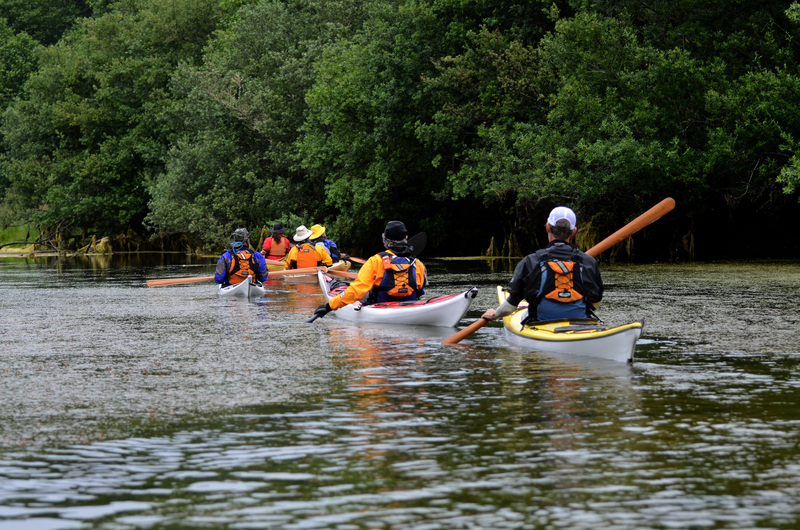 We continued up the main part of the river for a ways but didn’t travel very far. 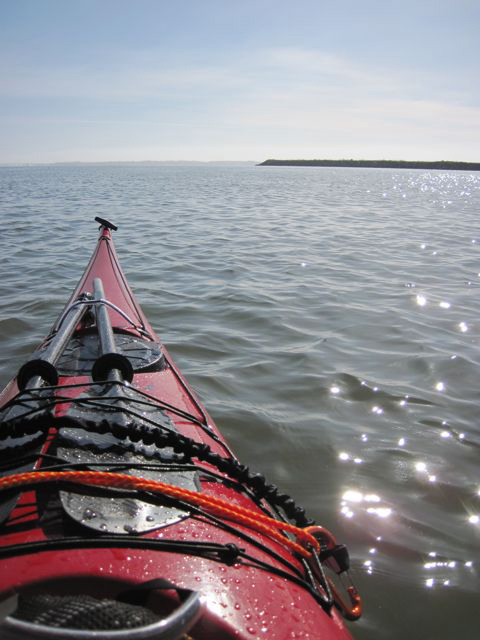 It had been a good day and a relaxing paddle and we headed back to the put-in for beer, peanuts, and farewells.